I'm been putting off this particular post for ever so long. Don't ask me how long, it's just been very long. In fact I have made this particular recipe at least three times since I first came across it's first posting in August. I saw this recipe last year in Ellie's blog . Then a couple of months later it appeared in Ju's blog . I guess this cake must be good if it's appearing so frequently. Furthermore how wrong could you go with an orange cake. In fact this cake is quite an intense orange cake as a fair bit of juice and zest is called for. 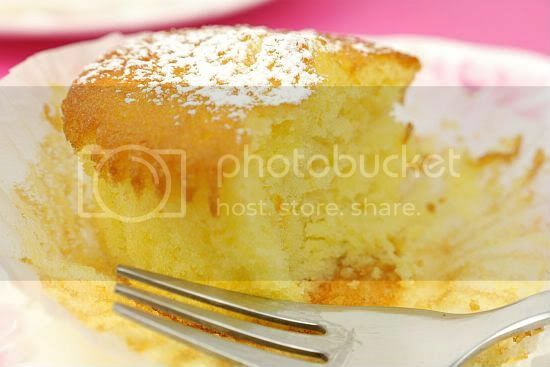 The amount of butter and sugar, being equal parts suggested an orange pound cake, thus a somewhat denser cake. But boy was I wrong! The cake is so soft and it reeked of orange flavour and smell. It was absolutely delicious. One thing I did do was reduce the amount of sugar used as I usually would do with all the recipes I have so far tried. I prefer to turn this recipe into cupcakes as it;s much easier to serve out. The texture of the cake is not compromised at all. I made these one time for my pet groomer's son who is about 3 years old and the little boy loved it so much. I'll probably bake her another batch next month when it's time for my two fur-boys grooming. 1) Preheat the oven to 170C. Grease and line a 22-cm clip-sided round cake with non-stick baking paper. 2) Using an electric whisk, cream the butter and sugar together for 4-5 minutes until very pale. Beat in the eggs, one at a time, beating very well between each one, if necessary adding a spoonful of flour with the last egg to prevent the mixture from curdling. Beat in the orange zest. Add the flour all at once and mix in well, then slowly mix in the orange juice. 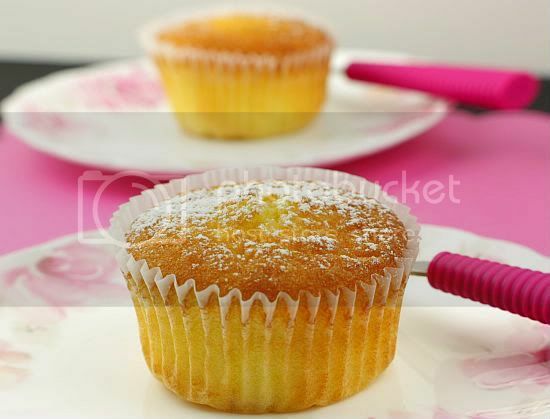 3) Spoon the mixture into cupcake liners and bake on the middle shelf of the oven for about 18 - 20 minutes or or until a skewer, inserted into the centre of the cake, comes out clean. If it starts to brown too quickly, cover loosely with a sheet of lightly buttered foil. 4) Cool cupckaes completely before icing. 5) For the icing, sift the icing sugar into a bowl and stir in the orange juice until you have a spreadable consistency. Spread it over the top of the cupcake. 6) If you are not keen on icing the cupcakes, just leave them plain - they are equally as delicious. Or else dust with a bit of icing sugar for a more special effect. Look very yummy! 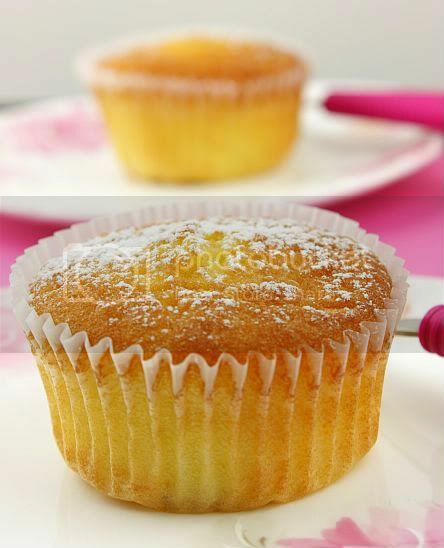 I like simple cupcake just like this .... and might just leave the icing out too. Looks yummy! Will want to try out soon. This is hubby favourite cake. I like it without the icing too :) Glad you made them! Love very nice! The look so light and fluffy. Divine! hi tigerfish, you are too kind. promise to post more yummy cakes! hi angie, ellie, ju, i like this plain as well. some cakes need to be naked so that you can taste the full flavour. hi busygran, hope u try this out - let me know what you think of it once you do. hi el, yes these are extremely fluffy and moist cakes. even after 3, 4, days, they taste just as great. hi zurin, i know what u mean .. i too have a long list of "must bakes/must cook". Hey, are you all trying to infect me with the cupcake bug!? You've tempted me into baking cupcakes! Plus, I do miss piping! Hahaha! These cupcakes definitely look sunny, a complement to its mediterranean-citrusy theme! I love turning cakes into cupcakes. These do look divine, the colour is so intense! Delicious looking cake. I love anything citrus. It's definitely on my list of "Recipes To Try Out SOON"! brinkka2011 says: Youre so right. Im there with you. Your blog is surely worth a read if anyone comes throughout it. Im lucky I did because now Ive acquired a whole new view of this. I didnt realise that this issue was so important and so universal. You absolutely put it in perspective for me.